2:28 a.m. — Police were notified of a missing or runaway juvenile from the 400 block of Portland Way N.
3:32 a.m. — A resident from the 300 block of S. Market St notified police of a suspicious person who was staring at their house. 12:16 p.m. — Police were called to Galion Middle School regarding a drug investigation. 1:18 p.m. — Caller notified police of a baby left in a car parked at Caleb’s Brookside Deli. 6:39 p.m. — A resident from the 800 block of S. Market St requested police assistance in a dispute with a landlord. 9:46 p.m. — Caller notified police of a resident from the 800 block of South St. who had numerous junk/unlicensed vehicles sitting around his house. 9:58 p.m. — Police were notified of a possible suicide attempt in the 600 block of N. Columbus St.
10:13 p.m. — Caller notified police of 3 juvenile males hanging around the side of DK’s Drive In. 10:40 p.m. — An employee of Burger King on Harding Way W. notified police of a suspicious male who had been in their parking lot since approximately 4 p.m..
7:42 a.m. — Caller notified police of a young child walking near the street in the vicinity of Harding Way E and East St.
10:29 a.m. — A caller notified police of a possible scam involving someone out of the country. 2:14 p.m. — Police were notified of a domestic dispute in the parking lot of Tubby’s Pizza. 2:35 p.m. — Caller informed police of drug paraphernalia found while cleaning out an apartment at Easton Way Apartments. 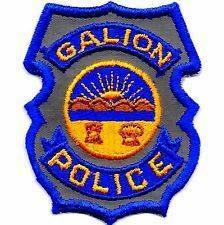 4:18 p.m. — Police were notified of a reckless driver headed into Galion on St Rt 61. 5:20 p.m. — A resident from the vicinity of Maple Heights Dr. informed police that had heard possible shots fired in the area. 7:00 p.m. — Caller from the 200 block of LeHigh Place notified police of a man who had attempted suicide. 8:58 p.m. — A resident from the 900 block of Harding Way E. reported a missing or runaway juvenile. 9:46 p.m. — A caller notified police of a juvenile who was making suicide threats in the 900 block of Harding Way E.
9:51 p.m. — Police were notified of juveniles in the roadway at the Sk8 Place on S. Market St.
9:54 p.m. — A male and female were arrested for under age consumption at a residence in the 400 block of Grand St.
10:17 p.m. — Caller notified police of a group of disruptive juveniles behind Wendy’s on Harding Way W.
12:54 a.m. — Police were notified of a large group of people getting into an argument in the 400 block of Portland Way N.
2:41 a.m. — Police spoke to individuals were were getting ready to fight in the 200 block of Harding Way E.
3:56 a.m. — Caller notified police of loud music from a neighboring residence in the 300 block of Orange St.
7:10 a.m. — A resident from the 300 block of Grove Ave. informed police that their vehicles had been entered the night before. 11:17 a.m. — Police were informed of a resident in the vicinity of Harding Way E and First Ave who had cut down a tree and was burning the brush. 4:46 p.m. — A female was arrested in the 200 block of Eighth Ave.
6:55 p.m. — A resident from the 400 block of Hensley Ave. notified police that juveniles had been throwing trash in their yard. 8:03 p.m. — A non-injury accident was reported near St. Rt. 309 and 61. 3:25 p.m. — Caller from the 100 block of Second Ave. notified police that their daughter was threatening suicide. 4:05 p.m. — An employee at McDonald’s notified police of a group of juveniles who were being disruptive. 7:44 p.m. — A caller from the 200 block of N. Union St. notified requested help with a juvenile. 7:51 p.m. — Police were notified of a vicious dog in the 300 block of Sixth Ave.
8:10 p.m. — A non-injury accident was reported in the vicinity of E. Church St. and Columbus St.
8:24 p.m. — Caller informed police of a group of disruptive juveniles in the vicinity of Church St and Heise Park.